Home > Miniature Gnomes > Garden Gnomes > Beach Gnomes > Purple Mankini Gnome - OMG! Purple Mankini Gnome - OMG! Also know as "Gnomercy," this lawn gnome will stop at nothing to keep your garden visitors entertained! When the first samples of our new OMG Purple Mankini Gnomes, the entire office literally froze in loving hysterics! One of the Funniest Garden Gnome Collections we've ever produced, taking your gardening gnome collection to an entirely outrageous new level! 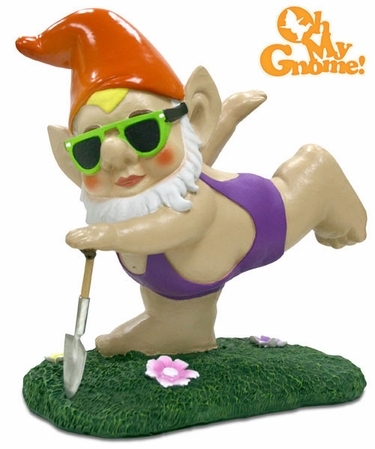 Everyone loves the Borat-style swimsuit on our original full G-String Mankini Gnome, and we're sure you will adore these new family friendly Garden Gnomes with a added free-spirited, yoga-style, gardening flair unparalleled! Size: 11.5"H x 10.5W x 6"D. Durable Poly-Resin w/protective finish. Wood & Metal Shovel. Solid base for Outdoor Enjoyment or Indoor Display. A Must-Have addition to any Unique Gnome Collection! Butterfly Mankini Gnome - OMG!